Since I started writing my blog, so much around me seems to take the shape of the ideas I am discussing. It makes me wonder whether it is my own awareness that has sharpened my observations, highlighting things that I had previously overlooked, or whether it is, in fact, new winds blowing around us. I was debating this with myself when I saw the pictures from the latest Chanel fashion show held by German designer Karl Lagerfeld during Paris Fashion Week in September 2014. 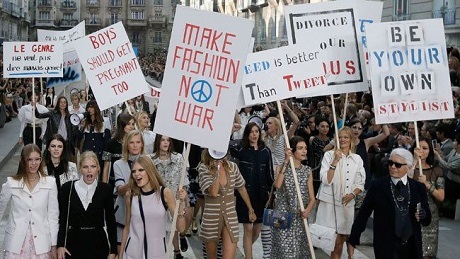 After displaying the Spring/Summer 2015 women's ready-to-wear Collection, on a catwalk fashioned to look like a Parisian boulevard, Lagerfeld appeared with models who staged a "demonstration” celebrating the anti-establishment spirit of the 1960s. 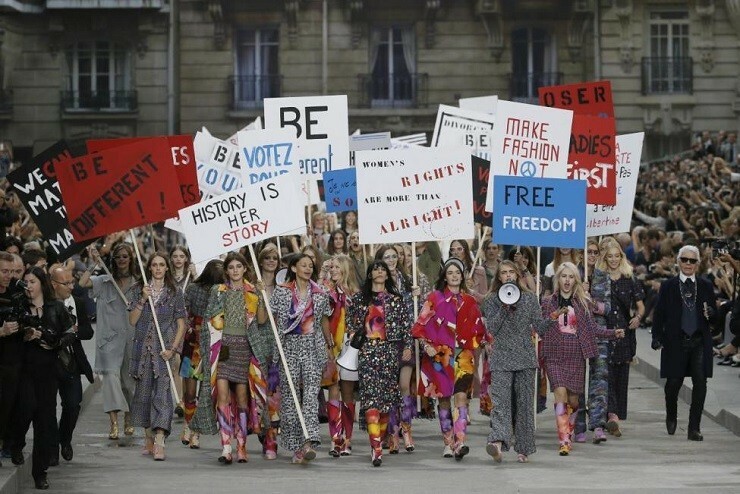 The models carried signs which resonate strongly with my beliefs, as reflected in many of my other posts ("Take a Stand – Prove a Point," "Fashion and Lifestyle" and more). Lagerfeld was emphasizing humanitarian ideas relating to freedom, human rights, and peace, but he also highlighted feminist ideas supporting equal rights for women and arguing women’s capacity to influence their own environment as well as history. But many of his motivational messages related to individualism and personal self-expression: "Be different,” and "Be your own stylist," being just two of the inspiring ideas exhibited. I thoroughly enjoyed seeing these messages. Obviously life has much more to it than slogans and catchwords, but even these provocative expressions, when part of a greater manifestation, add up to nothing less than a revolution whose impact is yet to be seen. 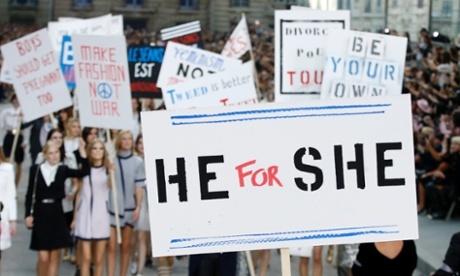 "Feminist" may have been chosen by Time Magazine's readers as the word to be banned in 2015, but actions speak louder than words and the fashion world has spoken! For further discussions and opinions, you may want to visit this and this articles.